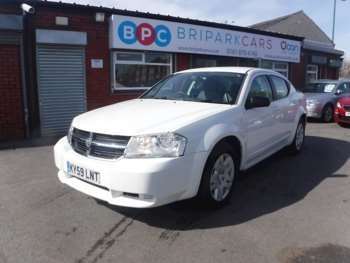 The Dodge Avenger first appeared in the UK in 2007. Although it sounds like a powerful American muscle car it most definitely isn't. What it is is a fairly sensible family saloon car in some ways comparable to the Mondeo, Laguna, Accord, Passat, Avensis and C5 but with a quirky appearance. It was made available in a range of four-cylinder diesel and petrol engines designed to appeal to the European market. The used Dodge Avenger does not look much like your average family car, it has a toned and athletic appearance with an aggressive front bumper inspired by a pair of Oakley sunglasses once owned by its designer. Its appearance seems to divide opinion right down the middle and people tend to either love it or hate it. The interior is of a fairly low quality and helps to explain why the Avenger was so reasonably priced when it first came to market. Its ergonomics are fine though and the interior and boot are spacious even when compared to its rivals. The boot has a capacity of 438 litres which can be expanded even further by folding the rear seats forward. Second hand Dodge Avenger cars for sale are not common but are reasonably priced when they do appear. The Avenger was always priced under £15000 as new and has depreciated steeply since then. Diesel versions are much more sought after than their petrol counterparts due to their increased reliability and improved fuel economy. The Dodge Avenger is an uncomplicated beast and its mechanicals are reliable with no known recurring faults. The typical used Avenger owner probably won't have thrashed it either. One thing to look for is scrapes and knocks on the extremities of the car due to its unusual curves. Replacement parts for used Dodge Avengers are reasonably prices, some examples being brake pads for £55 for fronts and rears coming in at £45. A replacement alternator will set you back around £300 and £220 gets you a new starter motor. The most appealing of the approved Dodge Avenger range is the 2.0 litre diesel with its 138bhp driving a six-speed manual transmission. Its engine is sourced from Volkswagen and known to be reliable and fairly efficient. The car's relatively low weight means that it accelerates well from a standing start although it sometimes struggles with its own torque and relies on the traction control. The Dodge's chassis is by no means the best in its class but the car will show some response when pushed. The Dodge Avenger represents a useful antidote to boredom with the usual medium range family options. Its sleek, aggressive appearance sets it apart from the crowd and the chances of there being another one down your road are very slim. It probably isn't as good a car as many of its direct rivals but if you are in the market for something a bit different at a reasonable price this could be just the car for you.